The cup embodies refinement and civilization, but for Siegrist it is an object of everyday use: we drink coffee from a cup to keep us awake, just as we drink tea from it to make us fall asleep. The number of cups in 31 Cups, initially strung together with thread, corresponded to the days of the months. 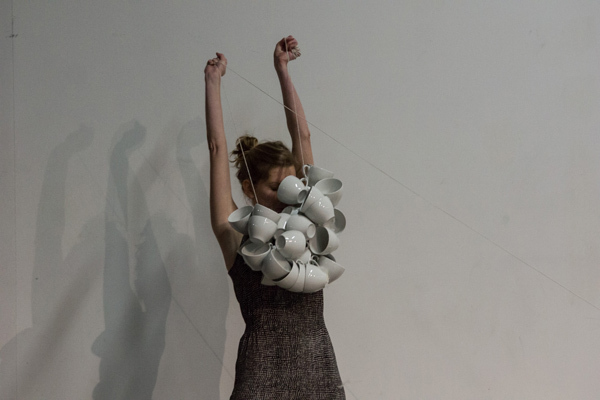 In Siegrist’s poetic universe, the cup became a container of dreams, symbolically represented by white feathers and black beans that the artist would shake out of her capacious black leather boots, aiming for the white porcelain cups she had previously lined up. Calling to mind magic rituals, the white feathers that softly fell to the ground stood for dreams, whereas the black beans, which made the porcelain ring as they hit the bottom of the cup, embodied nightmares. 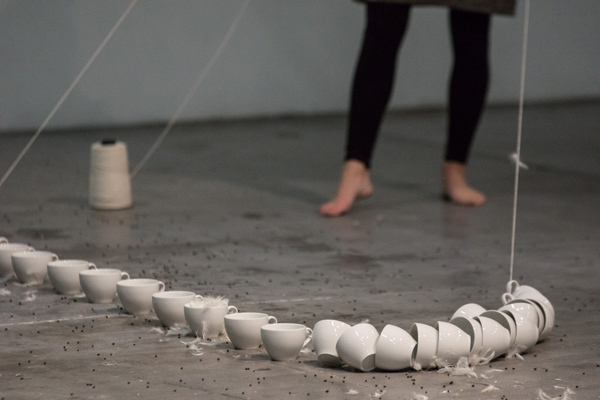 At the start of the performance, the artist walked up to the audience holding in her hands a single white cup on a saucer, which she placed on the ground. Instead of drink, the cup contained thin strips of type-written paper fanning out round its edges. 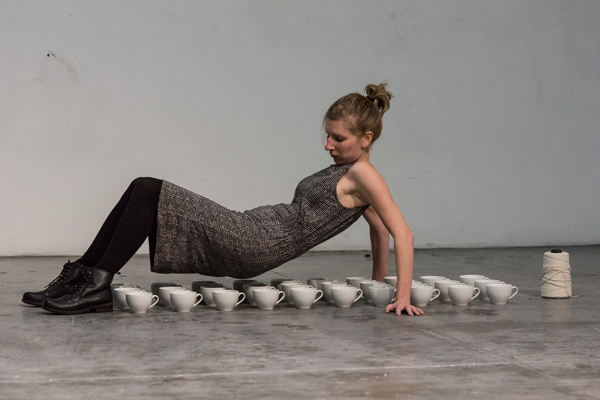 Having scattered some beans and feathers on to it during the performance, the artist brought things to an elegant close by brushing these aside and drinking the contents of the cup in one draught. The final image the spectators were left with was that of the paper strips protruding from the artist’s mouth, not unlike the golden rays sometimes bearing words in early Renaissance Annunciation scenes. One of the strips scattered on the ground read “there weaker than a new-born lamb. In his dreams he” on one side and “the drugged meal in the inn two nights ago and he had” on the other.